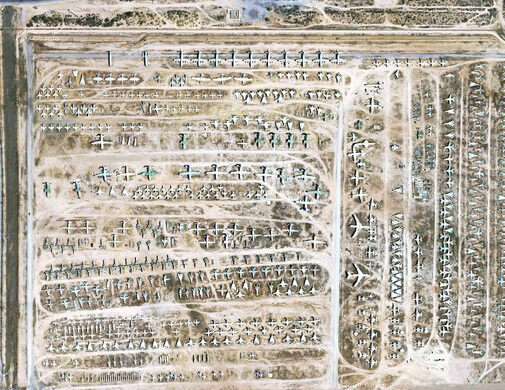 A partial view of the Davis Monthan Air Force Base via GoogleEarth. 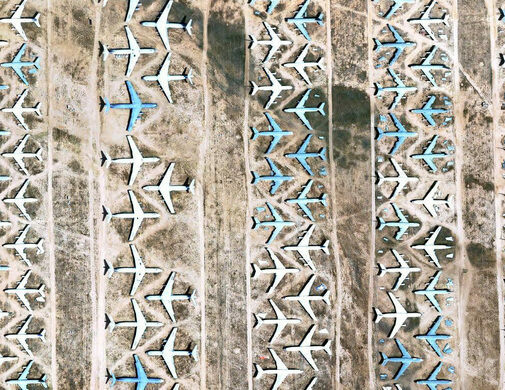 Airplane aficionados rejoice! Heaven has been found and it’s on the grounds of the Davis-Montham Air Force Base in Tucson, Arizona. 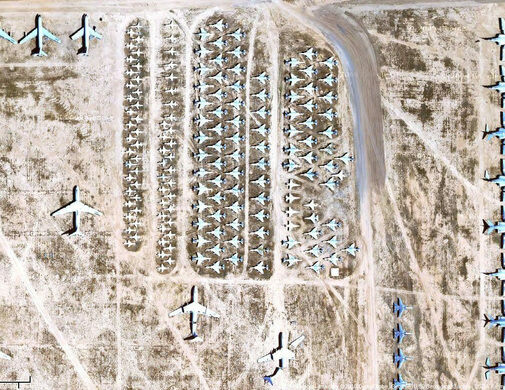 The 2,600-acre area, officially called the 309th Aerospace Maintenance and Regeneration Group (AMARG) though popularly known as “the Boneyard,” is filled with retired aircraft, including almost every type of plane flown by the United States Armed Forces since World War II. 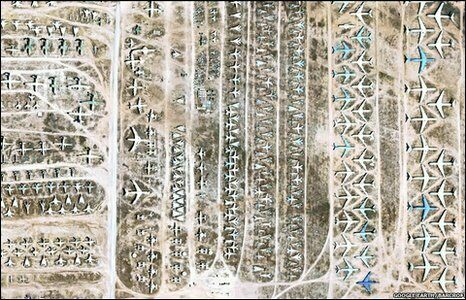 Immediately after World War II, B-29 and C-74 airplanes were parked here in order to salvage parts. The aerospace junkyard has been growing ever since: B-52 bombers from the Cold War are parked next to F-4 fighter/bombers used during the Vietnam War, while civilian planes like 707s bring some diversity to the neighborhood. The parts gleaned from the decommissioned planes are used in maintaining and repairing current Joint and Allied/Coalition warfighters. 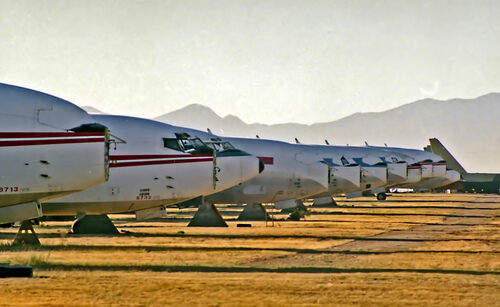 Official figures from the Defense Department estimate that by using replacement parts culled from the Boneyard, every one dollar spent generates eleven dollars in savings through reuse. Tucson’s arid, high-altitude make it an ideal storage place; rust and other deterioration occur here at a much slower rate. 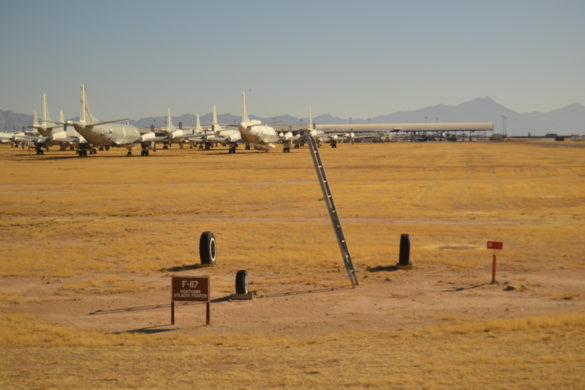 Due to its unique landscape, the Boneyard is regularly used by Hollywood to stage post-apocalyptic and action movies. 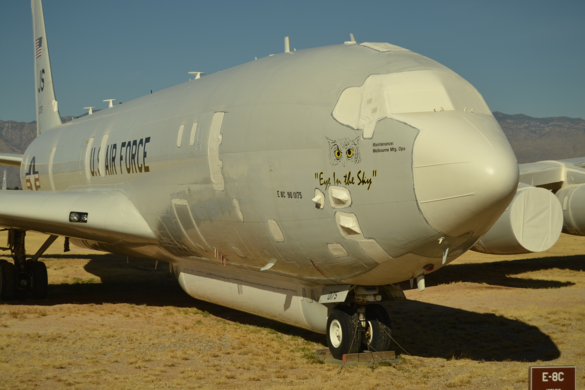 General public access is not permitted, though tours are offered by the Pima Air and Space Museum. Contact them by calling (520) 574-0462 or visiting www.pimaair.org. A Tucson museum and performance space full of found-object movable sculptures. This soviet pilot's graveyard is filled with headstones made of airplane fins.